My philosophy on alternative recipes, such as this gluten free banana bread recipe, is that you shouldn’t really be able to tell the difference between the classic version, and the version that it replicates. A banana bread recipe for the celiacs. It’s sometimes necessary to make adjustments to recipes to accommodate the unique dietary restrictions that certain pepole have. Even if you don’t personally have these restrictions, you should have some backup recipes in your arsenal just in case. People make their own unique dietary decisions for a variety of reasons. Sometimes it’s for health, sometimes it is out of necessity due to allergies, and sometimes “just because”. It shouldn’t matter what the reason is, because its important for me to create tasty alternatives for my readers to ensure that everyone can enjoy my delicious bread recipes regardless. If this creation were compared directly to another conventional healthy banana bread recipe, I think you would be hard-pressed to pick which one didn’t have gluten in it. In a large bowl, combine the brown rice flour, starch, sea salt, baking soda and gluten free baking powder. In a separate bowl, mush together the bananas to create a puree, and add eggs, maple syrup, milk, vanilla and citrus zest. Combine the contents of both bowls and mix them together. Pour the mixed contents into a large baking pan, I used a glass casserole, and bake for 50 minutes. When you can poke the center with a toothpick and it comes out clean, you’re all done with this gluten free banana bread recipe and it’s time to enjoy! There you have it, a delicious banana bread recipe without gluten. Whether you avoid gluten for health reasons or for other reasons, or perhaps you’re making this as a treat for a friend who can’t eat gluten, this recipe is sure to be a hit. You can even add some chocolate chips, if you would like to sweeten things up a bit, however the maple syrup does a very good job of that. Maple syrup can be expensive depending on the season, you can substitute it for honey if you would prefer. I’m going to stray a bit from my usual bread recipes which teach you how to bake bread. This time around, I’ll be sharing a delicious garlic cheese bread recipe in such a way that it will be ready to share almost immediately. This will differ from some of my other recipes, because the ingredients are more open to personal preference. What really makes this bread recipe special is the way that you prepare it, so you can use as much as or as little of each ingredient as you would like. I will provide you with a guideline, but feel free to make adjustments to suit your own tastes. For example, if you find that the recipe calls for too much butter and not enough cheese, or vice versa, you know what to do! This garlic cheese bread recipe uses several different types of cheese to draw out as much flavour as possible. If don’t have all, or any of them, feel free to make a substitution for the cheese of your choice. This is true for the bread itself, as well, as you can use whichever kind of bread you prefer. Preheat your oven to 550°F. Some ovens don’t heat up to this temperate, in this case just set it to as hot as it goes. A very hot temperature is the trick to having a soft inside with a crunchy outside. Cut your bread in half, and then in half again via the other direction, leaving you with four equal pieces. Spread the butter evenly across each piece of bread. Microwave the bread for about 15 seconds to melt the butter. Spread your cheese across the bread. Now, sprinkle the garlic powder and herbs on top of the cheese. Place the bread in the oven once it’s preheated. It will only take about 8-12 minutes depending on the temperature of your oven. Keep an eye on it! Once the cheese is completely melted and started to bubble around the edges, you’re all done. It’s that simple! This makes a great addition to many pasta and salad dishes, or a delicious snack all on it’s own. You can prepare this garlic cheese bread recipe quite quickly, and customize it to suit almost anyone’s taste! If you’re like me, you’ve looked through dozens of bread machine recipes in search of that perfect sourdough bread machine recipe. In my own experience, most bread machine recipes have been great, except when it comes to sourdough. 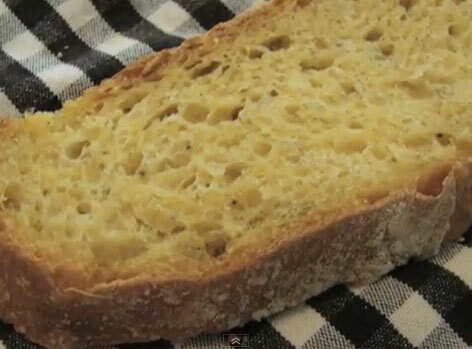 Why’s it so challenging to find just one fantastic sourdough bread machine recipe? Come here, lean in close, and I’ll tell you a little secret. They’re not all bad, I have found a fantastic recipe for sourdough using a bread machine, and I’ll share it with you, under one condition. That condition is that you have to promise to share this sourdough bread machine recipe with your friends, or at the very least make it for them whenever they ask (As long as they ask nicely!) I love crusty breads to dip into a warm, hearty bowl of soup. I have heard of people who swear by dipping their crusty breads into water, milk, and even wine. However you choose to enjoy it is up to you. 1 1/2 tsp of bread machine yeast, or quick active dry yeast. 1 tsp of bread machine yeast, or quick active dry yeast. As mentioned, you will need to prepare the starter a week ahead of time. Start by dissolving the yeast in the warm water, and then add the rest of the ingredients for the sourdough starter. Mix everything together very thoroughly until evenly blended. Cover with a towel and allow it to sit on the counter at room temperature undisturbed for a week. Once it has a sour smell and many little bubbles, it’s ready to be refrigerated, where it can wait until you’re ready to make the bread. Measure 1 cup of your sourdough starter and place it in the bread machine, then add the rest of the ingredients from the “Bread” section above. Some machines will offer you a particular order to put in the ingredients. I have found that it doesn’t make a huge difference but it may be worth looking into for your partcular model of bread machine. Use “Basic” or “Normal” setting (Will vary by machine.) and set the crust to light. Cooking time will vary depending on your machine, but your work is all done. Allow a few minutes for the bread to cool, this gives you time to throw together your favourite spinich dip or just to enjoy the amazing aromas that are filling your home. After we finish carving our pumpkins, it’s a tradition in my home to bake a delicious loaf of pumpkin bread, and I’m going to share our favourite pumpkin bread recipe with you. I like to use fresh pumpkin that’s left over from the carving. It can get chilly in autumn and a warm loaf of bread from the oven makes a nice treat after a day of carving pumpkins. Now, if you aren’t able to get fresh pumpkin, you can certainly make this pumpkin bread recipe with canned pumpkin as well, making it an excellent treat all year round. I urge you to give this recipe a try none the less the next time you’re in a pinch. Most people won’t be able to tell the difference, so it will be our secret! This recipe makes two normal sized loaves, or one giant loaf! 1) If you are using fresh pumpkin for this recipe, it’s very simple to prepare the pumpkin puree yourself. Cut the pumpkin into pieces and boil or bake it until it is tender, then remove the skin and it will be soft and easy to puree. Skip this step if you are using canned pumpkin. 2) Preheat your oven to 350oF (That’s 180oC). While you wait, grease your baking pan (or pans if you’re making two smaller loaves) and coat it with flower. 3) Next, combine the pumpkin puree, eggs, vegetable oil and sugar into a medium sized bowl and mix until they’re evenly blended. 4) In another bowl, combine the flour, baking soda, salt and the spices. If you prefer certain spices to others, you can adjust the amounts in accordance to your own tastes. 5) Combine both the dry and the wet mixture, whisk them together slowly into one bowl and then pour the mixture into your greased and floured baking pan. 6) Bake in oven for 45 minutes, or until you can poke it using a toothpick and have the toothpick come out without any batter sticking to it. There you have it, a delightful alternative to banana bread that you can make year-round. It’s fluffier and less dense than a lot of pumpkin bread recipes, and the spices bring out a seasonal warmth that’s always welcome come the fall.